The United States is looking for a stable and durable relation with India but a lot will depend on how both sides will align themselves on various global issues be it Ukraine, climate change or terrorism, experts said at the India Today Global Roundtable in New York on Friday. India has the financial and diplomatic resources today to take forward its interests but Washington will want a stable relation with New Delhi, Bruce Jones, the director of Project on International Order and Strategy, Brookings Institution, said. The US will like to see how India contributes on global issues. The nuances are tricky but a lot will depend on how New Delhi responds to Washington’s aspirations, he said. Referring to the BRICS grouping, he said there is a lot of positivity in that initiative, for instance, the BRICS Bank project is a good move but Russia has also created problems in Ukraine and India cannot afford to overlook these issues which will cost its ties with the US. The World Bank certainly needs a competitor; the Western model of development is pretty poor, he said, adding India’s penchant to ignore Russia’s excesses may hinder its ties with the US. Lisa Curtis, senior research fellow at Heritage Foundation, said India being a multi-religious multi-ethnic democracy there is a lot of converging interests between India and the US. The recent trade agreement between India and Japan is quite significant. Japan has committed $35 billion to India. Chinese President Xi Jinping’s visit, however, did not go so well due to the border tensions. The US, however, would never commit such huge sums of money. It is for the private sector to do so, she said. 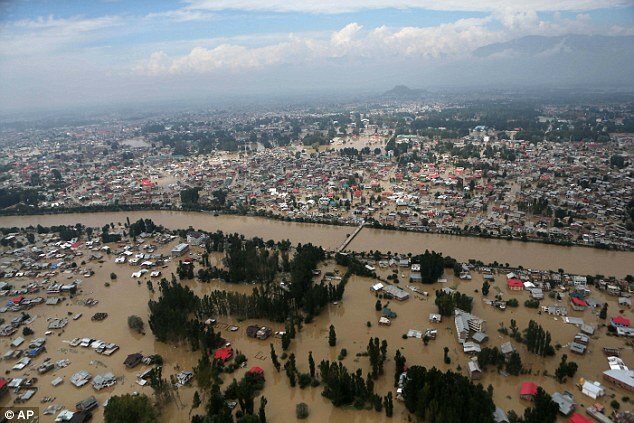 SRINAGAR, Kashmir — Early this week, as the flooding in Kashmir was entering a new and terrifying phase, the Indian Army’s public information office received a call from Raheel Khursheed, a former journalist and digital obsessive who serves as the director of news, politics and government at Twitter India. He had a proposal. Over the weekend, floodwaters had inundated ground-floor equipment rooms for most of the region’s telecommunications service providers, crashing cellphone networks across the state. Local officials had no way to contact the federal government, or one another, or the army, which had been mobilized as part of a rescue effort. Though the army has satellite phones, they were of little help without knowing where people were waiting for rescue. There was one place where information was flowing at a nearly unmanageable volume, and that was on social media. Distributing relief goods in Srinagar, Kashmir, on Friday. With telecommunications largely knocked out, social media has helped rescuers locate people. So many messages were surging into Twitter under the hashtag #KashmirFloods that on Tuesday Mr. Khursheed’s colleagues commissioned a piece of code that could winnow out those that identified stranded people. He then called the Indian Army — which has only two officers permanently assigned to monitor social-media postings — to offer the authorities a slimmed-down, organized feed that he described as “a continuously updating stream of ‘save me’s”. More than 400 people have died in the disaster in India and Pakistan, while some 130,000 have been rescued from the flood zone, authorities said. In this week’s frantic rescue effort, one unexpected development is thearmy’s use of Twitter, WhatsApp, a messaging service, and Facebook to reach families. Twenty years ago, when social media first emerged, India’s government — like its counterparts in Beijing and Moscow — regarded it warily, as a force that could undermine state power. 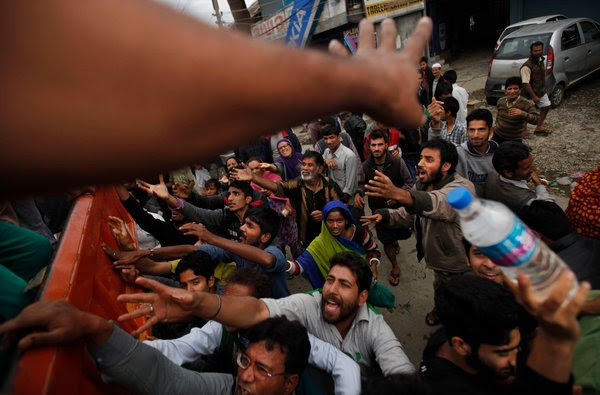 In the restive, majority-Muslim region of Kashmir, in particular, state authorities have been swift to block access to material they considered incendiary. However, as this week’s rescue efforts suggest, “the government is now seeking to conduct its business through these media,” said Samir Saran, a policy analyst who worked as telecommunications executive in the early 2000s. One driver of this change, he said, is the new prime minister,Narendra Modi, who regards social media as a central link to the public. Mr. Modi’s example has filtered through the system. The authorities said Friday that 130,000 people had been rescued from the flood zone. More than 400 have died in the disaster in India and Pakistan. In a near communications vacuum, 3G Internet connections remained usable, and those lucky enough to have them found themselves inundated with distress calls. At Twitter India, the goal was to prune some 400,000 flood-related messages into a “smartfeed,” something that has been done for sports, news and live events, but never for an emergency. The list of distress calls would then be sent in multiple directions, feeding into a “Person Finder” built byGoogle and provided to the army’s public information office, which had previously consulted with Mr. Khursheed about using social media. 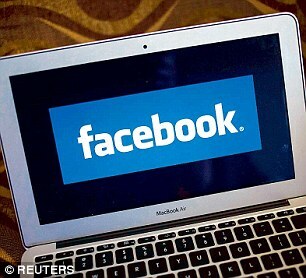 He said the army had assisted about 12,000 people whose cases were reported over social media. But that resistance faded as political parties adopted social-media strategies, again as a result of Mr. Modi’s election. The number of Internet users in India is expected to surpass that of the United States this year, according to a study released by Google India and A. T. Kearney. It also predicted that the number of mobile-Internet users in India would triple by 2017, to 480 million from 155 million. As a platform, Mr. Saran said, social media is already integrated into India’s often lively public debate. Tragedy has struck Kashmir once again. That it is perhaps the severest since Independence is undeniable. The human despair, spirit and resolve are all on display, and the entire country (real and virtual) seems affected by nature’s cruel intervention. The efforts to rescue those stranded are feeble as the institutions, infrastructure and administrative resilience have been found wanting – yet precisely because of this, the courage and heroic efforts of individuals and some organisations stand out in stark contrast. Floods: The entire country (real and virtual) seems affected by nature’s cruel intervention. Even as the embankments built in the times of the Maharaja have been breached by ravaging waters, the unfolding tragedy and response is also about the ‘angels or demons’, depending on your take on it – Social Media and the Armed Forces. The last 72 hours have seen the near total collapse of the phone network, and power lines have collapsed. This has complicated coordination and rescue, because stranded people have no way of telling rescue centres of their plight. Worse still, Delhi is cut off from the Government of J&K, while the Government of J&K is cut off from the army, which is coordinating rescue efforts. The army is the only body there that has managed to maintain some semblance of intra-organisational communications due to satellite phones. However, it has no way of knowing the location where people are stranded, or how many and how critical their situation is, since the normal method – air reconnaissance – is difficult at best given the cloud cover and weather. And the much-vilified social media is coming to the rescue. Even as large parts of the mobile communication infrastructure have collapsed, some wireless communication and the traditional wire line communication networks have allowed people access to social media and various messenger services, websites, and some agencies. It has also allowed a degree of dissemination of situational reports, videos and distress messages, many of which have reached the army. Whatsapp, FB messenger, Twitter and others are the most potent tools for the rescue teams in the valley today. As a result what we have is the army using satellite phones to communicate, but basing its rescue efforts significantly on guidance from Whatsapp, Facebook and Twitter. In that sense these have effectively replaced the search helicopter, the emergency beacon and the communications network of the valley. For the governments at the Centre and in the state of J&K, which have frequently demonised social media, this must be a moment of revelation. In February this year, the then Home Minister, Sushil Kumar Shinde, had vowed to “crush social media” to great applause from within his party and some others. Yet today the home secretary cut a sorry figure, claiming “there is no means to communicate with anybody” till the 15 wireless systems he has sent to be set up in the valley come online. Social Media, angel or demon? Let the debate begin. The second story is that of the ‘men in green, blue and white’. Among the nation’s armed forces, they are reviled by a few liberals and a section of those in Kashmir, at the receiving end of Pakistani venom and terror, and frequently derided by the political class in the state and centre. Yet had it not been for the army’s rescue teams and its “infrastructure of occupation,” as secessionists would call it, how many more lives would have been lost? At a time when the democratically-elected government of J&K has failed in its civic duties in buttressing the embankments (which they should have known about anyway) and a home ministry that is fumbling in the dark, it is this supposed villain that has come out as the knight in shining armour. It is this same “infrastructure of occupation” – helipads built on apple orchards, hospitals built on peach orchards and supply dumps built on farm land – that are now being used so effectively to rescue the stranded, treat the wounded, and provide relief supplies to the displaced. It is this same infrastructure with its bulldozers that is being used to clear roads, and the army trucks that sustain the “occupation” that are being used to ferry in essential supplies for the “occupied”. 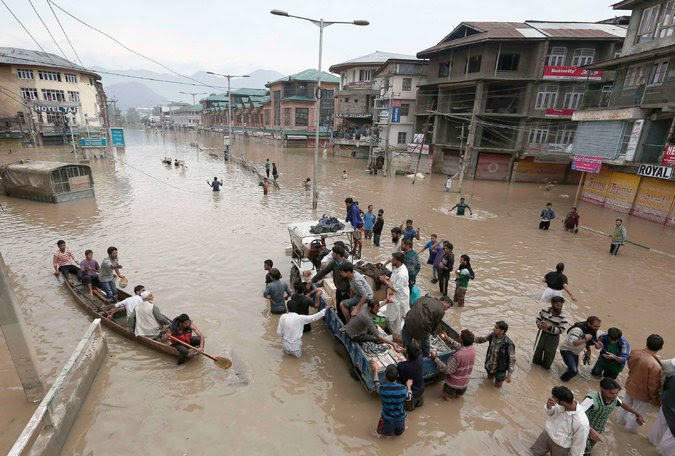 Given the police, local government and central government networks failed within the first few hours of the flood and the Doordarshan system which could be used as an emergency communications system also collapsed in this period, it has been the army’s communication systems that have provided the only link between J&K and the rest of the country. It is the maligned Armed Forces Special Powers Act used to “suppress” Kashmiris, that the army is using to deliver critical supplies to the “occupied”. And yet vultures who some in Kashmir refer to as “freedom fighters”, would rather support infiltration even at this time, then help their brethren. The IAF, let this debate end. This is not to say that social media and the deployment of the Armed Forces are always virtuous. The use of social media for malicious purposes is proven. The use of the medium to incite and radicalise is also rampant. Yet it is a force for good as we saw this past week. Challenge and vilify the user, do not condemn the tool. Similarly, the deployment of armed forces has resulted in actions that are highly avoidable. Some of their heavy-handed interventions have resulted in justifiable anger and resentment. Here again, challenge the political mandate and policy direction from the government, not the army, which remains a force for good. The editorâ€™s free articulation of his views can ensure voices of public figures can often be drowned out. I am a noble soul and was a spiritual glint in my parent’s eyes. I am the editor of a newsroom in the mightiest democracy of the developing world. I have immense responsibilities; to my image, to my brand, to my viewers and to my ever growing legion of fans. News is all about perceptions and I am the master conjurer; I love stoking your imagination and I love being an Editor. For the last twenty-five years I have been part of a great game that I first devised and then played, with the rules always keeping up with my moods. News is, but a reason that brings me and mine closer, our monologue is what defines the nation, my sermons are what weaves together the believers and my outbursts are what keep the nation straight. I answer to a higher calling and carry a spiritual burden. I love being a digital gladiator, I love being an Editor. I am the toast of the town. I have the best cars, reside in posh parts of town, host the fanciest of parties and am invited to every classy bash. Everyone who is anyone has my mobile number. Those who want to be someone, want my number. The numbers I delete are of those about to be obsolete. My recommendations for minister, for constitutional posts, for everything that means anything under the Indian sun, count for everything. I love being the hub, I love being an Editor. The past two decades or more of political chaos were the cue for me to assume leadership. In the absence of a worthy national leader, every ram, shyam and ghanshyam, in or out of the cabinet,tripped over themselves to give me a scoop -through leaked cabinet papers, or edited taped conversations. I know about government decisions before they happen. My voice on prime time is the national edict of the day. My criticism rolls back domestic policies and my whims lead to or prevent international crisis. I love being responsible. I love having the troubles of the world rest on my broad shoulder, I love being an Editor. The Clintons talk to me of their plans and Kerry curries favour with me. I discuss the Middle-East with the Sheikh, human rights with The Aga Khan and secularism with the Pope. I know more about climate change, trade, IPR and security than I care to remember. Yet, my humility allows me to invite meek voices on my show. I need them as I need to share my wisdom. It is my adherence to the highest principles of corporate social responsibility that makes me share my studio with lesser beings. I love being humble. I love being an Editor. What impresses me most about myself is how politically correct I am. I question the morals of politicians and businesses and babus and all the wayward souls. I fight to keep my studio mine alone. It is an endowment from the almighty. I resist any attempt by any political party, ideology or business agenda to capture this sacred space. I show great accommodation when the nation seeks it. I allow colleagues to promote political agendas for months before finally taking the plunge and joining a political party. This is not space capture by a political unit as some have observed. This is a training programme for becoming spokespersons of political parties. I love grooming leaders. I love being an Editor. My job requires courage and this is what excites me most. I stand besides booming guns in the Himalayas because this makes for good TV. Yes, the infantry may cop a bit of counter fire – but that is the nature of the beast and brutes. I courageously describe the progress of counter terror operations in Mumbai to our next door neighbour, because you see news is global, information is power and would it be fair to deny me to the rest of the world? I love being valourous, I love being an Editor. I hate the corporates and everything they stand for. They take credit for creating the business we’re in. Just because they created the platform, the networks and provided the technology and funds? Huh! They’re missing the wood for the trees because ‘I am Content’ and therefore I am the business. I hate their demanding accountability from the newsroom. What do they know about the power of this space? Or, how to exercise it. After all, did I not suppress a coal scam or two or a pharmaceutical fraud with sophistry? Did I not exonerate guilty as hell CEOs in the court of public opinion? Heck! 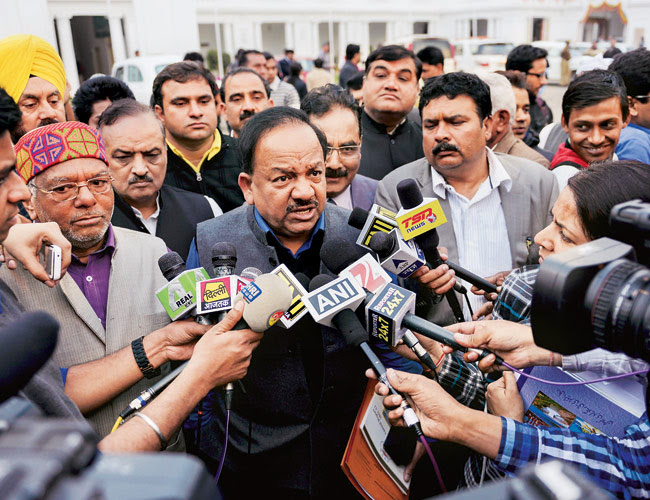 Did I not cover up my virtuous friends land grabs in and around Delhi? I hate transparency, cloak and dagger love is so much fun. I love all the deals in the dark. I love being an Editor. But the moment seems to be slipping away and a new game is in town. A man elected by the masses is in power, a government with a mandate to govern is on the job. And these accursed ministers appointed without my blessings. Aagh! Journalism through “access”, once a fine art is now dying, much like those dying crafts this nation hates to treasure and preserve. I feature in my sob stories every now and then. Self-pity is my companion, international press my friend. I’ll have to bide my time. Better still, I think I’ll perfect the prototype of a new-age victim. I love being a martyr, I loved being an Editor.